Today is Thanksgiving. We have fun on Thanksgiving. 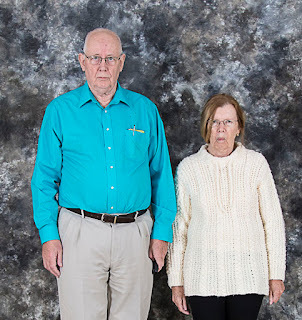 Here we are having fun. Since last November, two additions have been made to the tribe, further outcome of a frighteningly fecund gene pool. The newbies appeared in the form of great grandchildren, each one the product of a different grandchild with of course, assistance from appropriate mates. Amber, daughter of Martine, daughter of we dorks dropped Charlie back in May and Traci, wife of Matthew, son of Martine, still daughter of we dorks produced Alivia just a couple of weeks ago. Click here for see more pictures including the new anklebiters. While we were holed up in Ribeauville we checked out some adjacent villages on the map that were close enough to cycle to and selected several of them to visit. South of where we were there are four villages all ending in wihr, Hunawihr, Riquewihr, Mittelwihr and Bennwihr. Thus, bicycles primed, we set off to see what these tiny towns had to offer. Riquewihr was where we hit pay dirt. Another one street attraction but a street loaded with everything gawkers like - towers, arches, portes, fairy tale houses, eclectic retail, bustling restaurants and last but not least, thronging tourists! The other hamlets were pleasant enough but were slowing fading communities struggling to cope in a changing world. On the other hand, Riquewihr had the critical mass and good fortune to have tapped into tourism and seemed to be surviving if not thriving. 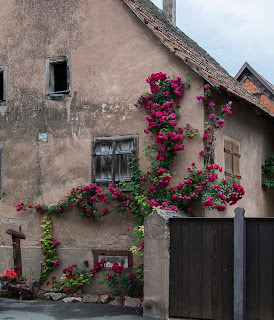 The town is also known for Riesling and other great wines produced in the village and, having escaped serious damage from WWII, claims to look more or less as it did in the 16th century. A bit of a stretch but still a very enjoyable excursion. More pictures here. Ribeauvillé is in the Haut-Rhin department of the Alsace region in north-eastern France. The picturesque town is located around 10 miles north of Colmar and 47 miles south of Strasbourg. The first known mention of the town was in 768 CE as Rathaldovilare, roughly translated as "Villa of Ratbold" where, in old German "Ratbold" signified "the boldest man of the counsel". 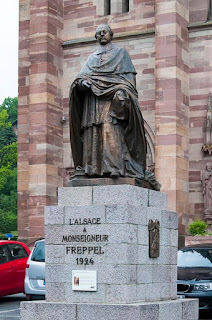 Over time, the town passed from the bishops of Basle to the lord of Rappoltstein the king, or protector, of the wandering minstrels who purchased his protection by payment of a tax. The Rappoltstein family died out in 1673 and the Pfeiferkonig office (king of the pipers) passed to the palatine counts of Zweibrücken-Birkenfeld. 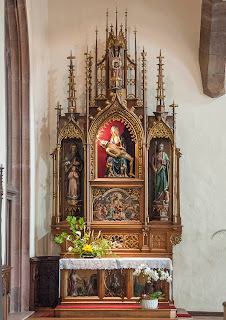 The minstrels had a pilgrimage chapel near Rappoltsweiler, dedicated to their patron saint, Maria von Dusenbach, and here they held an annual feast on 8 September. The Counts of Ribeaupierre were the last lords of the town before the Revolution. Essentially a one street town, Ribeauvillé is still partly surrounded by defensive walls, contains many well maintained medieval houses and two excellent Gothic churches. On the hill to the west of the town stand the ruins of three famous castles, Saint-Ulrich, Girsberg and Haut-Ribeaupierre, which formerly belonged to the lords of Ribeaupierre. Overall, a well managed and nicely presented tourist attraction in which to while away an interesting day or two. More pictures here. Colmar (Kolmar in German) is the capital of the Haut-Rhin department in the Alsace region of France. 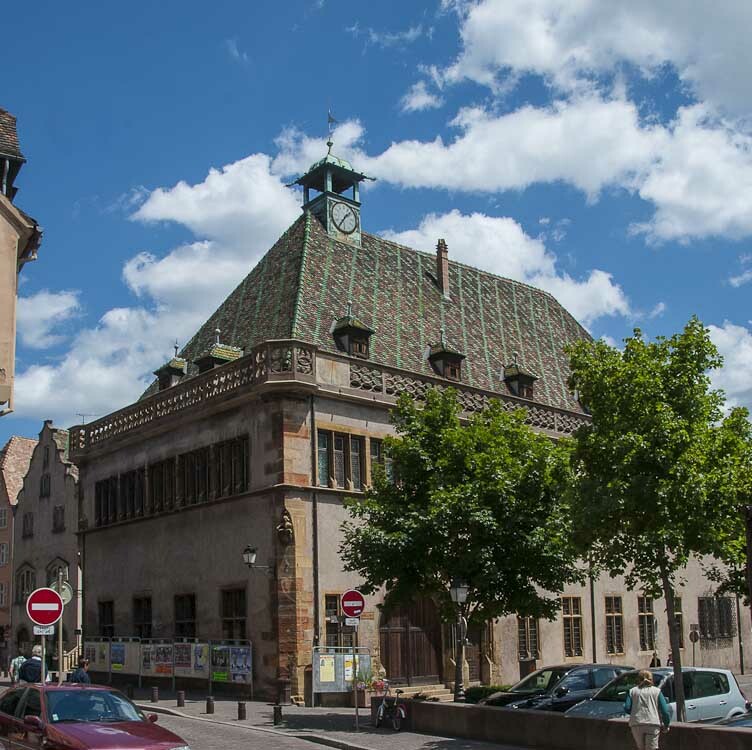 It is situated at the foot of the Massif des Vosges and, at 65,000 population is the third largest city in the region. 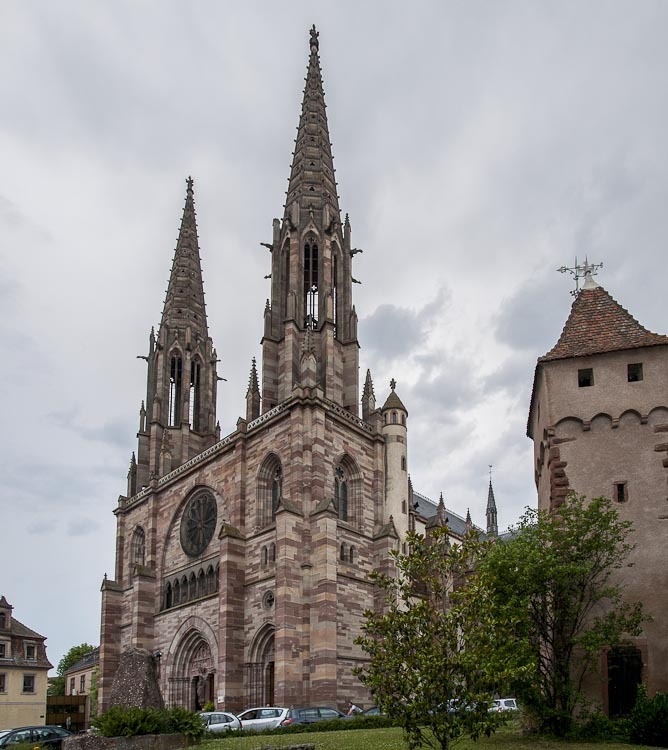 Colmar is the driest city in France with average annual rainfall less than 21", a result of its location at the foot of the highest part of the Vosges. Originally an ancient free city of the Holy Roman Empire, Colmar became French in 1648 following the Treaty of Westphalia and, by 1789, boasted about 11,000 inhabitants. 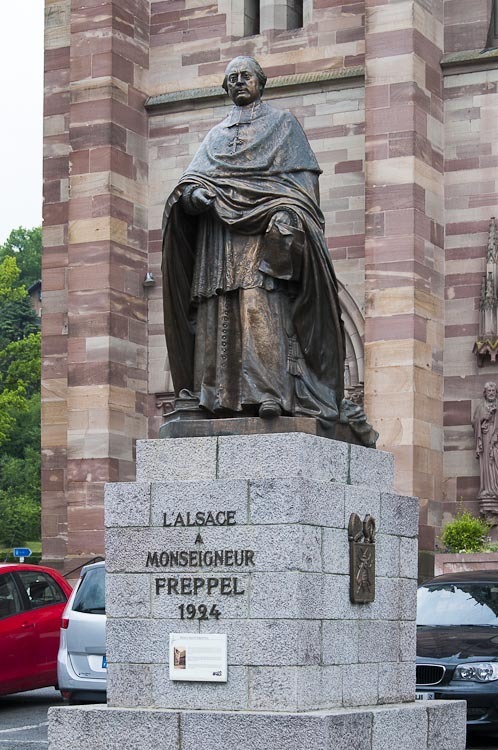 After forced annexation to the German Empire in 1871 it became the district capital of the Upper Alsace in the Reichsland of Alsace-Lorraine and remained so until the signing of the Treaty of Versailles in 1919 that ended WWI. The city then remained French until February 1940 when it was again annexed by the Third Reich in WWII. 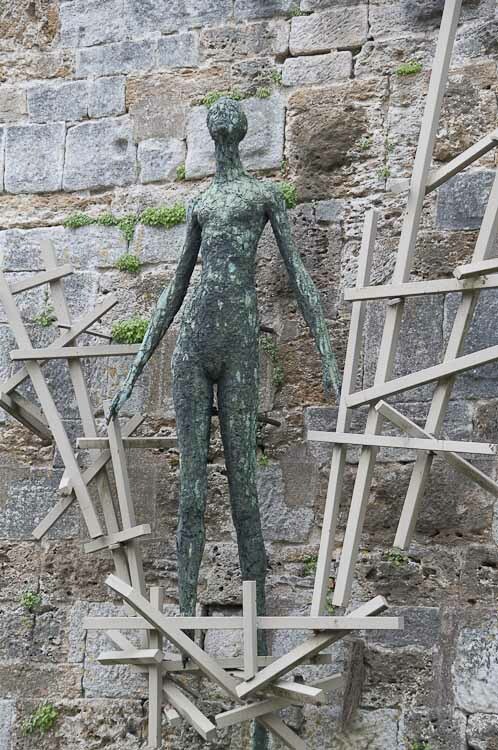 In February 1945 the city was the last to be liberated from German occupation. Colmar has many well preserved historical buildings and numerous pedestrian areas making a leisurely walk about especially enjoyable. Outside of tourism, the city has a burgeoning electronic and electro-mechanical components industry along with pharmaceutics production. Lots more views of this photogenic city are here. After leaving Obernai we had a light driving day to our next port of call which was Colmar. Between the two, there were three small towns all ending in ...willer so we decided to investigate. First up was Gertwiller. Probably something to see here but almost every street was torn up (probably for cobbling) raising the expected parking difficulty from exasperating to impossible. We moved on. Zelwiller was next. Less than a one-horse town, there appeared to be no compelling reason for anyone to stop here even had there been a convenient parking spot. So onto number three - Goxwiller. First mentioned in 920 CE as Getenesvillare, then as Gokesvilre, Gotesviller and finally as Goxwiller it just about makes a one-horse town but is nicely maintained and we found convenient parking adjacent to the fire station. A relaxing place to spend an hour or so. More pictures here. 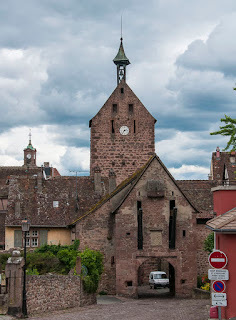 Moving further east through France, we left the Champagne-Ardenne region, enjoyed a serene but spectacular drive over the Vosges mountains as we crossed the Lorraine region before finally entering the Bas-Rihn department of the Alsace region, bordering on Germany. Our target was Obernai, a vibrant city bucking the trend of small French cities in that it is growing and has almost doubled its population to around 12,000 inhabitants over the last forty years. 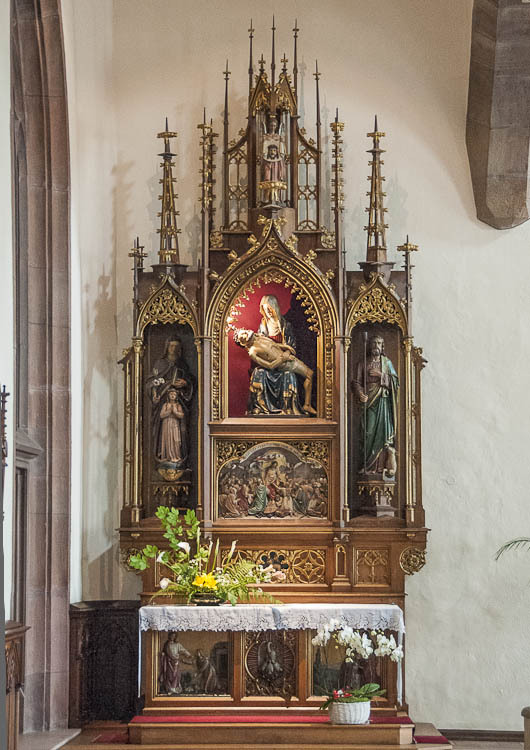 The area where Obernai developed was the property of the dukes of Alsace in the 7th century and where, legend has it, St. Odile, daughter of the Duke, was born subsequently to become the Patron Saint of Alsace. The name Obernai first appears in 1240, around the time that the village acquired the status of town and began to prosper. It reached its economic peak in the 15th and 16th centuries and in 1562 Emperor Ferdinand I saw fit to visit the town. Obernai was significant;y damaged, both physically and economically, during the Thirty Years War in the 17th century. It fell under foreign occupation at least twice in this period and, after being ransomed, was ceded to France in 1679. Although its fortunes improved as a result of this it never fully regained its earlier luster. In 1871 the whole of Alsace, including Obernai, was summarily annexed by Germany and was not returned to France until the end of WWI, nearly forty years later. In much earlier days, Obernai was a double-walled city with defensive ramparts separated by a roadway and both walls were replete with towers and gates. 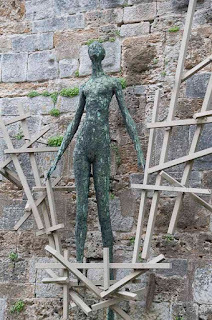 While there still is a "rampart walk" around the town, much of the structure was removed in the 19th century and the facilities put to other uses. Small sections of defensive walls have been retained however. Obernai is a center of wine and beer production as well as a significant tourist destination second only to Strasbourg in the entire Bas-Rhin department. Just 25 miles from Strasbourg and 15 from the international airport, Obernai is well situated for easy access. For views of this picturesque town on Market Day, click here. Langres, in north-eastern France, is in the Haute-Marne department of the Champagne-Ardenne region. The original settlement occupied a limestone promontory, a natural stronghold in turn occupied by the Celtic tribe known as the Lingones then the Gauls and later fortified by the Romans. The 1st century Triumphal Gate and other artifacts preserved in the museums bear testament to the Gallo-Roman town. The city's most remarkable feature are 2.4 miles of ramparts that surround the town, including seven fortified towers and seven gateways, all of which has been kept in excellent repair. Parts of the ramparts date back 2000 years, most of the gates and towers stem from the 15th and 16th centuries while the more recent citadel dates from the 19th century. The turbulent 14th and 15th centuries gave cause for the town to strengthen its fortifications which imbue the old part of the city with its fortified character today. The Renaissance, which returned prosperity to the town, saw the construction of many fine civil, religious and military buildings that today make this town of 8,500 souls a rich piece of French history. For more pictures of this historical treasure trove, see here for a tour around the wonderfully intact ramparts and check this link out for a look around the town inside the walls.